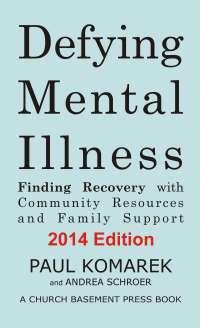 Here is the bibliography for Defying Mental Illness: Finding Recovery with Community Resources and Family Support. Allen, K. E. (2007). Developmental Profiles:Pre-Birth Through Twelve (5th ed.). Clifton Park, NY: Thomson/DelmarLearning. Barber, C. (2009). ComfortablyNumb: How Psychiatry Is Medicating a Nation. New York: Vintage Books. Block, P. (2002). The Answer to How Is Yes: Acting on What Matters. San Francisco, CA: Berrett-Koehler Publishers. Borderline Personality Disorder. (2011). Retrieved September 19, 2011, from http://www.borderlinepersonalitydisorder.com. Campbell, A. (1993). Men, Women, and Aggression.New York, NY: Basic Books. Carmody, J. (1993). How to Handle Trouble. NewYork: Doubleday. Carter, R. (1994). HelpingYourself Help Others: A Book for Caregivers. New York: Times Books. Carter, R. (1998). HelpingSomeone with Mental Illness: A Compassionate Guide for Family, Friends, and Caregivers. New York: Times Books. Corbett, S. (2009). WhenHelping Hurts: How to Alleviate Poverty Without Hurting the Poor — and Yourself.Chicago, IL: Moody Publishers. Council of State Governments Justice Center. (2002). Criminal Justice / Mental Health Consensus Project. New York: Author. Earley, P. (2006). Crazy: A Father’s Search Through America’s Mental Health Madness. New York: G.P.Putnam’s Sons. Goldsmith, S. (2002). Reducing Suicide: A National Imperative. Washington, DC: NationalAcademies Press. Goodwin, F. and Jamison, K. (1990). Manic-Depressive Illness. New York: Oxford University Press. Greek, M. (2010). How a Series of Hallucinations Tells a Symbolic Story. Schizophrenia Bulletin vol. 36 no. 6, pp. 1063-1065. Greek, M. (2011). Schizophrenia:A Blueprint for Recovery Athens, OH: Author. Grossman, D. (2009). On Killing: The Psychological Cost of Learning to Kill in War andSociety. New York: Little, Brown and Co.
Hallowell, E. & Ratey, J. (1994). Driven to Distraction: Recognizing andCoping with Attention Deficit Disorder from Childhood Through Adulthood.New York: Touchstone. Hobson, J. A. (1994).The Chemistry of Conscious States: How the Brain Changes Its Mind. Boston:Little, Brown. Jamison, K. R. (1995). An Unquiet Mind. New York: Knopf. Jamison, K. R. (1999). Night Falls Fast: UnderstandingSuicide. New York: Knopf. Komarek, P. (2001). Working with People with Mental Illness in the Criminal Justice System. Columbus, OH: NAMI Ohio. Komarek, P. (2004). You Are Not Alone: Mental Illness, Community Resources, Family Supports. Columbus, OH: NAMI Ohio. Kretzmann, J. and McKnight, J. (1993). Building Communities from the Inside Out: APath Toward Finding and Mobilizing a Community’s Assets. Chicago, IL: ACTAPublications. Lustbader, W. (1991). Counting on Kindness: The Dilemmas of Dependency. New York: FreePress. Lustbader, W.(2001). What’s Worth Knowing. New York: Tarcher/Putnam. McKnight, J. and Block, P. (2010). The AbundantCommunity: Awakening the Power of Families and Neighborhoods. SanFrancisco: Berrett-Koehler Publishers. The Merck Manualof Medical Information. (2007). New York: Pocket Books. National Prevention Council. (2011). National Prevention Strategy. Washington, DC: U.S. Department of Health and Human Services, Office of the Surgeon General. National Research Council and Institute of Medicine.(2000). From Neurons to Neighborhoods: The Science of Early ChildhoodDevelopment. Washington, DC: National Academy Press. Neugeboren, J. (1999). Transforming Madness: New Lives for People Living with Mental Illness.New York: William Morrow & Company. Payne, R. K. (2005). A Framework for UnderstandingPoverty. Highlands, TX: Aha! Process. Payne, R. K. (2006). Bridges Out of Poverty: Strategies for Professionals and Communities. Highlands,TX: aha! Process. Pinker, S. (1997). How the Mind Works. New York,NY: Norton. Pinker, S. (2002). TheBlank Slate: The Modern Denial of Human Nature. New York, NY: Viking. Porter, R. (2002). Madness: A Brief History. Oxford:New York: Oxford University Press. PTSD Overview — National Center for PTSD. (2011). Retrieved September 19, 2011, from http://www.ptsd.va.gov/public/pages/fslist-ptsd-overview.asp. Ratey, J. and Cameron, J. (1997). Shadow Syndromes.New York: Pantheon Books. Resnick, P. (2010). Risk Assessment for Violence. Presentation materials August/September 2010, Cleveland, OH. Search Institute. (2011). What Kids Need: The Building Blocks for Children and Youth. Retrieved September 24, 2011, from http://www.search-institute.org/developmental-assets. Schiller, L. (1994). The Quiet Room: A Journey Out of the Torment of Madness. New York:Warner Books. Solomon, A. (2001). The Noonday Demon: An Atlas ofDepression. New York: Scribner. Styron, W. (1992). Darkness Visible: A Memoir ofMadness. New York: Vintage Books. Thirteen/WNET New York. (2001). The Secret Life ofthe Brain. U.S. Department of Health and Human Services. (1999). Mental Health: A Report of the Surgeon General Rockville, MD: Author. U.S. Department of Health and Human Services. (2003). Preventing Drug Use Among Children and Adolescents, A Research-Based Guide. Rockville, MD: Author. Whitaker, R. (2002). Mad in America: Bad Science, Bad Medicine, and the EnduringMistreatment of the Mentally Ill. Cambridge, MA: Perseus Pub. Whybrow, P. C. (1997). A Mood Apart: Depression, Mania, and Other Afflictions of the Self.New York, NY: Basic Books. Wright, P. W. D. (2007). Wrightslaw: Special EducationLaw (2nd ed.). Hartfield, VA: Harbor House Law Press. Wright, P. W. D. (2008). Wrightslaw: From Emotions to Advocacy: The Special Education Survival Guide. Hartfield, VA: Harbor House Law Press.